By popular demand, a new tutoring program for students that would like tutoring during an entire semester. This program begins tutoring January 2019. You’ll get access to boot camp immediately and we’ll work on creating a study plan for you as soon as you sign up. The program lasts from January 2019 till June 2019 – so for six months. During January we’ll do some assessment tests with you to figure out what you need help with. Those tutor sessions we can tutor NCLEX, math, Meds, or Nursing subjects. 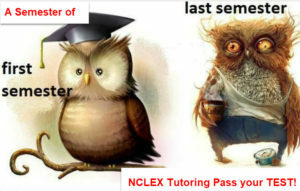 May and June – we tutor you 9 times each month (18) total – these tutor sessions will be focused on the NCLEX. So a total of 30 tutor sessions. So till December you can get this at a special price – $89 / month for six months. Payments would start immediately. Tutoring begins January 2019. This offer is limited and may be closed at any time.